IRSA is the worldwide radio sailing organization as an affiliated member of World Sailing. IRSA is dedicated to the enhancement of both current and emerging world radio sailing classes through the promotion and development of consistent class rules, measurement methods, radio yachting racing rules, and advice in running major racing events. Designates and reviews radio classes as International, Recognised, or Classic. Approves or delegates approval of World and continental championships of IRSA Designated classes. Administers the M, 10R, and A classes, including the management of their class rules. Coordinates and submits changes to Appendix E of the RRS. Gives or approves interpretations of the racing rules as they relate to radio sailing, including publishing the radio sailing Case Book. Gives or approves interpretations of the equipment and measurement rules as they relate to radio sailing. Gives or approves interpretations of the radio sailing class rules. Provides approved standards and templates for Notices of Race and Sailing Instructions. Provides or approves rules and guidelines for events: event management, event scoring, and umpiring of fleet racing. Provides or approves rules and guidelines on technical matters: interpretations, Questions and Answers, and measurement. 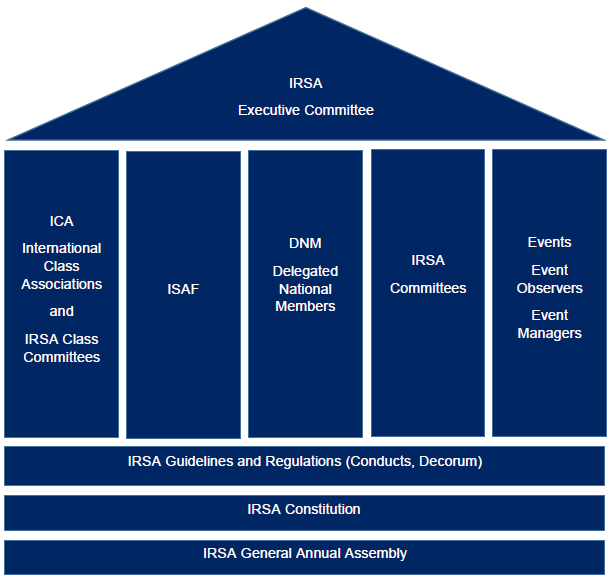 Monitors the quality of World and continental events of IRSA Designated classes, giving particular attention to rules observance and event management. Distributes and disseminates information about international radio sailing. In all of these activities, IRSA promotes international radio sailing, consults and liaises with its Membership (DNMs and ICAs) and World Sailing, and ensures its internal procedures and structures are effective, efficient, transparent in operation, and fit for purpose.